Operating directly under the National Command Authority, a relatively unknown entity of handpicked warriors are called on when the mission must not fail. They are the Tier 1 Operators. Over 2 million Soldiers, Sailors, Airmen and Marines wear the uniform. Of those, approximately 50 thousand fall under the direct control of the Special Operations Command. The Tier 1 Operator functions on a plane of existence above and beyond even the most highly trained Special Operations Forces. Their exact numbers, while classified, hover in the low hundreds. They are living, breathing, precision instruments of war. They are experts in the application of violence. 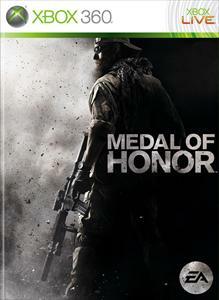 The new Medal of Honor is inspired by and has been developed with Tier 1 Operators from this elite community. Players will step into the boots of these warriors and apply their unique skill sets to a new enemy in the most unforgiving and hostile battlefield conditions of present day Afghanistan. Clean Sweep, is an elimination mode where players must rely on their own skills and teammates' expertise to prevail as the winning team. Clean Sweep is packaged and playable across two all-new maps (Bagram Hangar and Khyber Caves), as well as redesigned versions of the popular Diwagal Camp and Kabul City Ruins. Unlock all the weapons and modifications available in the Medal of HonorTM multiplayer modes. Get a Tier 1 arsenal from the start! Note: Weapon unlocks are not reflected in the unlock tree. Download the completely new mode, Hot Zone which includes 2 brand new maps, Hindukush Pass and Korengal Outpost, as well as 2 resdesigned original maps. Hotzone is as intense as it gets with coordinated all-out annihilation followed by strategic dug-in defense. Your mission is simple, control the area. If you're on the fence about picking up the new Medal of Honor, this Multiplayer Accolade trailer will equip you with the reasons you need. Download the Multiplayer Mode, Clean Sweep, along with two brand new maps called Bagram Hangar and Khyler Caves. Put your skills to the test in this last-man-standing game mode. Online Pass required to play. Enemy forces are dug in with a DShK, preventing evacuation of wounded Rangers. A six-man team volunteers to assault the ridge and secure an LZ in the latest MOH Experience Part 6: Danger Close. Unlocks the ability to access bonus content, including additional maps. Online Pass is non-transferable. Online features can be discontinued at any time with 30 days’ notice at www.ea.com/2/service-updates. Watch as Tier 1 Operators of AFO Wolfpack deal some long-range damage in this latest MOH Experience, "Friends From Afar". Watch as targets are identified and engaged from the air despite heavy resistance. In Objective Raid Insurgents swarm across the map to sabotage two objectives (Alpha and Bravo) using explosives, while Coalition forces must stop them and defend their installations.